Transport Minister Peter Styles (pictured) is giving no time frame for the sealing or even the upgrading of the Mereenie Loop Road, a key in efforts by the tourism industry to make Alice Springs again the gateway to The Rock. This is despite a clear indication that the Central Land Council (CLC) is willing to discuss any issues including access to gravel pits. “The length of road left to upgrade is approximately 180km long and would require $100 million plus to complete the upgrade,” says Mr Styles. And the CLC provided the following statement: “In October 1993 the CLC and the NT Government signed an agreement to permit the Mereenie Loop road to be constructed for tourist use. “The agreement specifically provided for the CLC to undertake all sacred site clearances for the new road, gravel pits and so on, and the existing road was built. “Without very significant concessions by traditional landowners over the years there would have been no road and despite its considerable commercial value as a tourist link the owners have never received acknowledgement of the benefit their decisions have brought to the local tourist industry. Says Mr Styles: “The most significant factor with sealing the Mereenie Loop remains cost, as with all major infrastructure projects, works will be prioritised as resources are available. 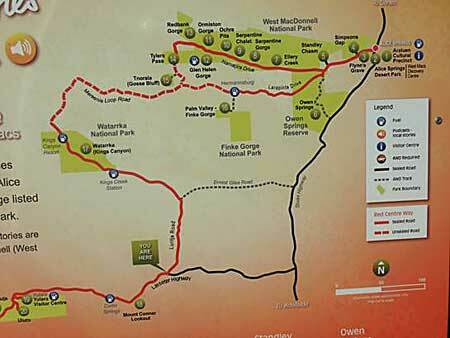 MAP: The unsealed section (dotted red line) of the Mereenie Loop Road starts at Hermannsburg (Natria) and ends at King’s Canyon Resort (Watarrka National Park). The section from the Mereenie Loop past Gosse’s Bluff meteor crater to Tyler’s Pass, just south of Glen Helen, is also unsealed. The short access from that road to Gosse’s Bluff is recommended for 4WD only. It is good to see the current Government is committed to enhancing visitor experiences in the Mereenie area. Perhaps they could find the 7 million dollars that was stripped from this area not long after the previous ALP government was voted in. With this more works could be done in what has become an important access highway not only for the tourist industry but for the many local communities and the gas and oil industries that are developing at a rapid rate. But the future as well. In reply to the outback experience of driving this road you only have to ask the many of our visitors that have come to grief on this road, if they enjoyed the drive. Yes, the scenery but not the road is a common reply. I must say, if all the tourist drivers that cost their bosses tens of thousands of dollars in repairs to buses by using this road, if you need to drive on dirt roads to get a high light of the tour you really need to get another job. As it has been mentioned, it is a great area for interest in plants, animals, local history and culture, all of this can be done on a sealed road. If keeping it dirt is a valid argument to getting more visitors why did they seal the Stuart Highway and the Lasseter Highway? In regards to the Giles road, it is a short cut, used for just that. It does have several small communities along it so it should be graded. But that’s it, with the country it runs through it would much likely cost as much as the loop road as the interesting colour of this road between the Stuart Highway and the Palmer river unfortunately is not cement, we call this clay, yes clay, if you stop and spit on it you may not get traction to leave. Unlike the Mereenie loop road it doesn’t have all the Western communities using it for main access north / south and the massive road trains travelling on it at an ever increasing rate serving what could be Central Australia’s largest developing industry. It would be good to ask the local communities and resorts in the area if they would like it sealed. If the locals would like it to be done then it should be, as this is where the only poor people in Australia that drive cars are hiding, as they are always the ones left behind with the bad roads the high cost of transport, accessibility to homes and services in town. These decisions should not be made on the opinions of those that leave in a few years and forget about the great dirt driving experiences back on the city express ways. Sorry Greg, [I’m writing] as a long serving tourist driver, using both Mereenie and Giles roads. From the tourist perspective (and I presume that’s the point of interest), it’s about the journey as much, if not more than the destination, and in that respect the Mereenie is the superior trip, and The “Outback Experience” for many tourists. The feedback I received from many of our foreign guests always included, as a highlight of their trip, the spectacular scenery the Mereenie offered and the adventure element of that journey. The many different desert habitats accessible on the Mereenie Loop made for great interest in plant and animal survival and human history stories, especially Aboriginal cultural use of those habitats. I understand the arguments for the bituminising of the Mereenie Loop road, but in my role as personalised tour guide / driver, I would not be upset if it was never sealed. Last time I travelled this road, all except a couple of kilometres of this stretch was sealed. The drive from Alice to Gosse’s Bluff via Glen Helen is an excellent road, and one of the best scenic routes I have ever been on. The short unsealed section is only a problem in very wet weather. If cost is the only problem why not seal or upgrade Ernest Giles Rd first 100 kms in lieu of 180 kms as it goes to the same place! I am no engineer but I am amazed at the quality of the 100kms of unmade surface that now exists on the Giles Rd. When teaching on a small community just off the Giles Rd. in the last half of the 1990’s most of the trip along it was a challenge, only fit for four wheel-drive vehicles. However, the surface now is terrific. It is just fine for two wheel-drive vehicles. In parts, particularly between the Stuart Hwy. and the Palmer River it gives the appearance, by the colour, that cement has been mixed with the dirt. The generous width is staggering too. Also,it would seem that regular grading is now applied. Whatever, if the Mereenie Loop had the same treatment if would offer a much cheaper and affordable alternative than a bitumen road.